I've done a search but cannot find a good answer. I reload 9mm range brass and sort by headstamp (mostly all Winchester, Remington, Federal and Blazer) and group by how many times I have fired them. Will I gain measurable accuracy sorting by case length? For example, sorting .749 to .754 and .744 to .748 or something on that order. I'm thinking of having a friend make a tapered gauge to slide the cases in an upright manner through a 6" horizontal channel with a linear bottom and a descending taper on the top starting at .760 going down to .740, demarking every 2 thousandths. Obviously if I have nothing to gain I'll put the idea in the "rotating file." Thanks for any insight. Be gentle. What's the depth of your chamber..? Unless it's custom cut for minimum headspace, it's probably wasted effort.. At any rate, the longest cases "may" benefit you at 50 yards. If you decide to pursue it, an indicator stand, and a ground standard will allow you to sort cases in a production style fashion.. Thanks Jerry. My barrel is an SA NM but I do not know the depth. I ASSume it is within SAAMI spec. Nice setup in the photo but beyond my tool set and available space. I'm thinking more along the line of a sliding the case vertically along the channel and the sized case would stop at the nearest .002 of it's length. Your take on the worthiness of the effort may relegate the thought to the "circular file." Thanks for the response. I may still make a gauge to sort out the under-spec cases to save caliper time as I am finding about 10% come under .744 maybe from too many previous reloads. IMO, it's worth an experiment before committing to tooling/gages. I seem to remember someone here (Mr. Keefer, was it you? That Starrett rig looks familiar...) has already reported some measurable and worthwhile accuracy gain in .45 ACP at 50 yards from using longer cases. Measure 20 or 30 cases to get the range of lengths. Calculate your desired intervals. Lock either the calipers or the micrometer at your longest - (minus) one interval, and dump all that won't fit inside into your first pile. Shorten the instrument to the next interval and repeat. I suggest shooting 20 of each length for comparison. For the most reliable sorting out of whether there is an accuracy difference, take the tedium of calculating mean radius rather than extreme spread. Do either two 10-round groups, or four 5-round groups, or do 21 and do three, 7-round groups. One of those target accuracy programs would be nice to use on the project. Include in the data whatever factory load your gun shoots best, as a control. Good advice. I was loading this morning anyway so I'll see what I can sort from my Blazer expanded-mouth stash. You are right about control groups. I always include at least one in all my recipe and COL evaluations. Thanks for taking the time Jerry and Grumpy. 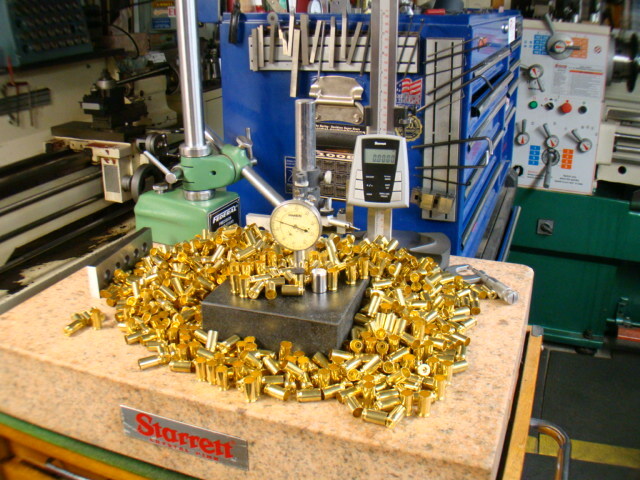 You could also order some Starline 9X21 brass and trim them to the max that will chamber. See if it makes a difference. Jerry's point, I think, is that it isn't going to matter unless you have a gun set up with minimum headspace. If the headspace is already 0.010-0.015 over minimum (I've seen much worse), trying to sort cases to find the long ones is a waste of time. (Because even those are too short for that chamber.) Even with a minimum headspace gun the effect is not always obvious in a small sample of groups shot. Presuming you taper crimp after seating the bullet, a longer case will take more crimp, increasing neck tension, and perhaps affecting the POI. Measurable difference on the target? YMMV. If you can shoot 2.0" or less at 50 yards (and that is STILL about 4 MOA), you will find that, generally, the longest cases will be most accurate. I have NEVER found sorting cases by head stamp to improve accuracy at all, except in a 0.6 MOA or better rifle. If you can't shoot 2.0" or less at 50 yards, none of these things will help. Quite a surprise. Just got done cleaning up after a range session testing 9mm case length. I will definitely repeat the test after Christmas weather permitting.
" " Blazer " .741 to .744 2 1/4" 2 7/8" with 2 flyers 7/8" "
20 " " .747 to .751 2" 3 1/8" " " " 1 3/4" without 2 5/8" 3 3/8"
The data are not in successive order, I shot 1 group of short brass against 1 of long at the same target for 10 rounds each target. I am not making any conclusions due to the lack of sample size. Nor am I making any statement only presenting the raw data to the nearest 1/8". My normal groups normally run 3/4" to 2 1/2" at 25 yds. so I'm guessing I was having an off day. Dave, testing at 25y is destined for futility. You really gotta hammer at 50y to get the full affect. It is not a totally wasted test. If it shoots bad at 25yds it is not going to shoot better at 50. Now, shooting shorter Win cases and comparing them to longer blazer cases can cause early hair loss. My point is at 25 yds the deviations may be too small to determine accuracy. I've not found many loads that won't shoot at 25 yards. james r chapman wrote: My point is at 25 yds the deviations may be too small to determine accuracy. I agree. My "good days" (sub- 1 inch to 2 inches) are never back to back with the same loads. My "bad days" (up to 3 1/2 inches) with the same loads are more numerous than the good. The bottom line is I love to shoot and explore variations with basically a stock RO; save for the FF3 red dot, EGW bushing, trigger pull and recoil springs. Realistically the new hobby is fairly frivolous as evidenced by the dot wandering as I squeeze the round off on my bench rest. The thrill of getting a very, very occasional 5/8" group keeps me in the game. Check out the link below. Jim Taylor wrote an article entitled "Secrets of Reloading The 9mm". In his article he talks about sorting by case length as you did. His tests indicate that the 9mm is most accurate with a case length of .750". I read the article quickly.. He basically, casually, mentions headspace, but doesn't indicate what the headspace is in the gun he's testing..How do you headspace off an extractor.?? You have to know what your headspace is.. Actually, to benefit from any of this, the headspace, which is breechface to chamber depth must be set when the gun is being built. Long brass is most accurate (45acp test) Neck tension is different between brands. Range brass = Poor accuracy. IMO. 45 to over 100 lbs. Thanks 1cav. Good reading and repeatable data. I've got the Speer #14 manual and it has the 9mm section. I'll print Mr. Taylor's text and data. No body wants to ever admit it, but if you KNOW what variables you are testing when you shoot, your sub-conscious can do a GREAT job of giving you the results you want. This is why double-blind testing is done whenever a PERSON is part of the equation. "For instance, in Speer Reloading Manual #11 I found that with 9mm handloads of 28,000 CUP (Coppper Units of Pressure), should you seat the bullet only .030" deeper into the cartridge case, the pressures jump to 62,000 CUP!! Enough to wreck a good gun." 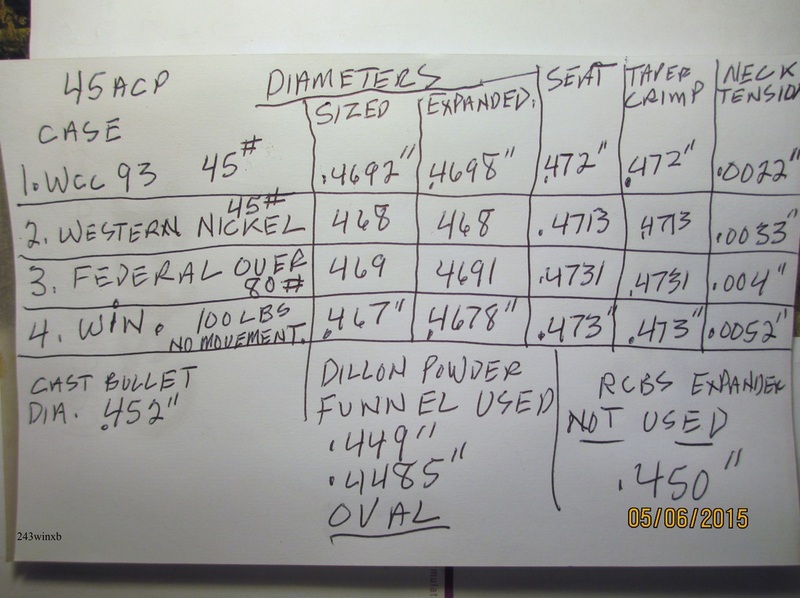 The only test I have read had the bullet being seated ¼" (0.250") deeper to achieve ~62,000 psi—and that was to warn folks about watching for bullet set back and doing a finger pressure test for such at the bench. I have never read of 0.030" doing this. Does the Speer manual really reference this and does it reference how to get the actual test report? I have NEVER seen case length variations like he reported. Yes, if you do have 0.020" variation in case length AFTER resizing (you don't worry about case length until AFTER you resize as case length before you size depends on the size of the chamber the case was fired it), you may need to sort. Personally, I wold be throwing the super-shorts away. Finally, 0.750" was NOT a magic number for case length. It simply supports my finding that cases of 0.750" after sizing or longer (what few there are) are the most accurate and should be set aside for match use. I STILL have NOT found any difference between matched head stamps and totally and completely mixed head stamps at 25 or 50 yards (and those mixed head stamps were not, say, two Win, two R.P. and one Fed, but the dregs of all the cases I didn't have five matched cases for and I never used more than ONE of each head stamp for a 5-shot group—thus, when I say mixed, I mean MIXED). Finally, 9x19 barrels exist that have groove diameters as large as 0.362"--Europeans like their over-sized bores. My Browning Hi-Power, which Browning told me was "well within specifications" has a groove diameter of 0.3587". I separated 9mm cases this week by wall thickness. I didn't have to do much measuring before I found that the Rem cases without the ring were consistent and thinner walled then Win, Fed, Starline or Speer. This was important for my little experiment. I loaded them with 158gr 0.357 LSWC. I have 15 rounds of 2.8, 3.2 and 3.5 BE. ready to try. The thinner case made it easier to seat the bullet (COL 1.100) and they feed perfectly in both my match 9's. I am still trying to find the "right" bullet and load for accurate lead loads. FWIW I believe COL and crimp are much more important then the length of the case.